The winners are Brian Hall of Berryville HIgh School, Makenzie Meyer of Eureka Springs high School, and Trinity McMahan of Green Forest High School. Also pictured is Dana Sue Busch, DAR Good Citizens committee chair. On February 14, 2019, at the Community Bank in Berryville, the Abendschone Chapter, NSDAR conducted the 2018-19 award ceremony honoring local high school seniors. The DAR Good Citizens Award and Scholarship Contest, created in 1934, is intended to encourage and reward the qualities of good citizenship. This entry was posted in Education on February 13, 2019 by abendschone. Abendschone Chapter, NSDAR celebrated the 67th birthday of their chapter on December 13, 2018. The featured program was given by chapter member Donna Wenger to commemorate the upcoming centennial of the women’s right to vote. She portrayed suffrage activist Alice Paul, who led the national effort to secure the vote for women. Pictured are Chapter Regent Margaret Scobee, Donna Wenger (in costume), and Luci Lund (niece of recently deceased member Stella Bucknam). This entry was posted in Patriotism on December 13, 2018 by abendschone. Pictured with Suzie Bell are Abendschone members who volunteer at ECHO. From left to right are Suzanne Williams, Ginger Malmstrom, Andrea Rowe, Suzie, Sherry Kerr, and Fayette Schmutzler. The Abendschone Chapter, NSDAR in Eureka Springs, celebrated the 128th anniversary of the founding of DAR and the National Day of Service at their monthly meeting on October 11, 2018. This entry was posted in Volunteer Initiatives on October 11, 2018 by abendschone. A special exhibit at the Eureka Springs Historical Museum opened in April of 2017 to commemorate the 100th Anniversary of World War I. Museum volunteer and Abendschone Chapter NSDAR member, Suzanne Williams, collected items from Carroll County, Arkansas residents for the exhibit. 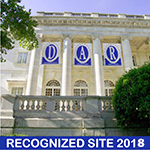 Several NSDAR members made contributions. The exhibit included a uniform, original sheet music, photos, maps of France, a letter from General Pershing, a feed bucket for horses and mules, and mess kits. Visitors were especially interested in the trench art, made from shell casings and spent bullets. The exhibit continued until the end of 2018 and was well received. Oil painting of Crandall Walker, a Eureka Springs “Doughboy” who was killed in action in the battle of Argonne Forest in 1918 during World War I. This entry was posted in Education, Patriotism on October 5, 2018 by abendschone. Eureka Springs Mayor Robert Berry, shown here with members of the Abendschone Chapter NSDAR in celebration of Constitution Week. The Abendschone Chapter, NSDAR in Eureka Springs, Arkansas, celebrated the U.S. Constitution at their September 13, 2018 meeting. This entry was posted in Education on September 13, 2018 by abendschone. The 2018 Osage District Meeting hosted by Abendschone Chapter on Saturday, July 28, 2018 held a baby shower. This entry was posted in Veterans on August 28, 2018 by abendschone. Abendschone Chapter NSDAR participated in the Elks Holiday Island Lodge’s 241st anniversary of Flag Day. Also participating were American Legion 36, Boy Scouts 67, Opera of the Ozarks, and a message from Pastor Bob Herring. Refreshments were also enjoyed! This entry was posted in Patriotism on June 14, 2018 by abendschone.